Not to be confused with these guys. I became enamored of this painting when studying Art History the year before I went to Europe for the first time—so enamored, in fact, with all the luscious Italian Renaissance art that I had to go see it in person. I was poor as dirt, but I bent all my will towards saving money to go. I quit Santa Monica College and worked full time for a year before applying to UCLA. My mother was freaked that I wouldn’t finish school, but I knew I would once I got a little traveling out of my system. Ostensibly, I was saving towards the Big U (and I did a little of that), but really I was hellbent on going to Europe. And I went. And then I came back and settled in to working part time to put myself through college. I did earn my BA, much to my mother’s relief. But, oh! The sights I saw before that. 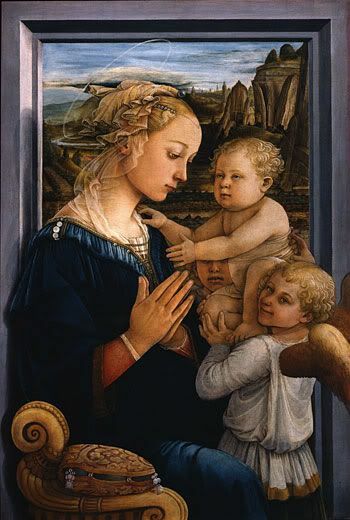 I saw the original of my beloved Lippi and many another wonderful painting at the Uffizi in Florence. And the David at the Academia! Ghiberti’s doors! So much, so much. I was swimming in honey beneath the Tuscan sun. You are currently browsing the archives for the romance	category.